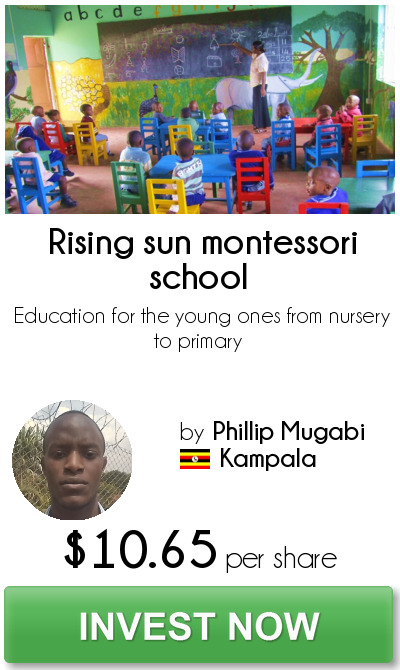 Rising sun Montessori School is a learning institution for the young ones from nursery to primary. We offer affordable education to the families in the central region of Uganda. Our shares are on sale on this site and you can grab yourself a couple of them to secure your money. We need partners in this cause in order to expand our market to a wider audience and benefit more people. We also need to improve the infrastructure of the project to suit the needs of the market. We are a team of professionals from different fields inclusive teachers, managers and other non teaching staff. We hope to develop Africa through educational services to the citizens.